Get ready to fall in love: Valentine Greetings from Victoria's Secret Supermodels Adriana Lima and Erin Heatherton. 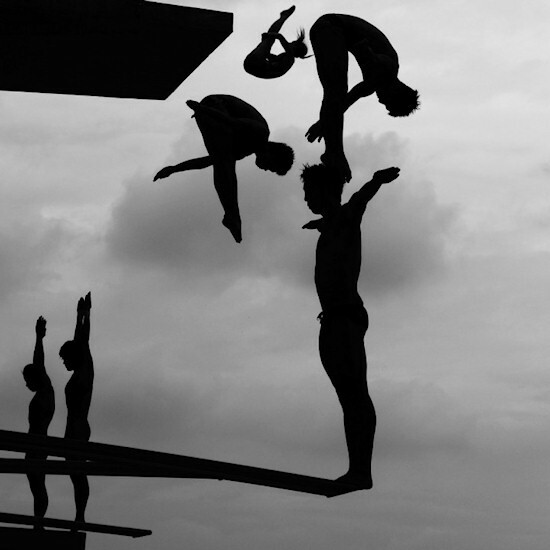 Divers practice during the 14th FINA World Championships at the Oriental Sports Center in Shanghai, China. — World Press Photo 2012, 2nd Prize, Sports Stories. A photo gallery of Alvin Ailey's amazing dancers, celebrating modern dance and the African-American spirit. The cover photo features Yannick Lebrun, in a breathtaking tiptoe posture. An amazeballs photo series styled and shared by Davee's Secrets and Melinda Guajardo: Black Onyx featuring Kara Gall from Ignite Models / Minneapolis. This year, my Red Carpet Golden Globe Award goes to the girl with the geo tattoo, aka Angelina Jolie, for wearing this white Atelier Versace satin robe with a folded neckline in red. Swedish graphics designer Viktor Hertz has "redesigned" the following logos, revealing the truth behind popular brands and their products. It's You, perfected! New commercial by Jesse Rosten pokes fun of commonly used Fotoshop features.